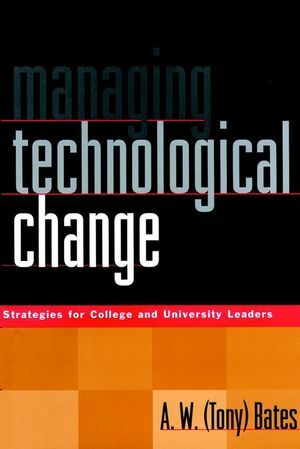 Implementing new technology at a college or university requiresmore than simply buying new computers and establishing a Web site.The successful use of technology for teaching and learning alsodemands major changes in teaching and organizational culture. InManaging Technological Change, Tony Bates -- a world-renownedexpert on the use of technology in university teaching -- revealshow to create the new, technologically competitive academicorganization. He draws from recent research and best practice casestudies--as well as on his thirty years of experience in usingtechnology for teaching--to provide practical strategies formanaging change to ensure the successful use of technology. Readerswill learn how to win faculty support for teaching with technologyand get advice on appropriate decision-making and reportingstructures. Other topics covered include reward systems, estimatingcosts of teaching by technology, and copyright issues. Bates alsodetails the essential procedures for funding new technology-basedsystems, managing the technology, and monitoring its ongoingeducational effectiveness in anticipation of future changes.Throughout the book, he maintains a focus on the human factors thatmust be addressed, identifying the risks and penalties oftechnologically based teaching and showing how to manage thosehazards. A.W. (TONY) BATES is director of Distance Education and Technology in the Division of Continuing Studies at the University of British Columbia in Vancouver, Canada. He has more than thirty years of experience in applying, managing, and researching the application of technologies to higher education and is one of the world's most quoted authors in the field of distance education. A founding member of the British Open University, he has also worked as a consultant on the use of technology in university teaching for the World Bank, UNESCO, state higher education commissions in the United States, the Canadian International Development Agency, and for universities and government ministries of education in over thirty countries. Confronting the Technology Challenge in Universities andColleges. Leadership, Vision, and Planning in a Post-FordistOrganization. Planning and Managing Courses and Programs. Technology Infrastructure and Student Access. Calculating the Costs of Teaching with Technology. Funding Strategies, Collaboration, and Competition. Organizing for the Management of Educational Technologies. Avoiding the Faustian Contract and Meeting the TechnologyChallenge.